Cook daal (do not mash it) and keep aside. Heat oil and add 1/2 tea spoon mustard. When they start popping, add chopped onion. Fry till they become translucent (do not make them brown). Add chillies and grind it into a smooth mixture. Heat remaining oil and add mustard and curry leaves. Fry for some time and then add chopped tomatoes. Close the lid and cook till the tomatoes are completely cooked and all water is evaporated. 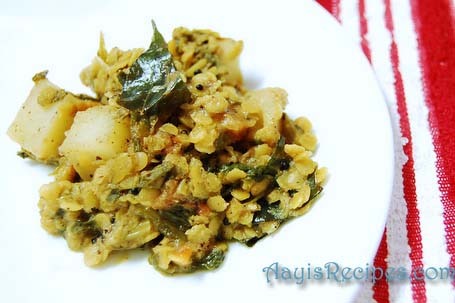 Add methi leaves and cook for 5min. Now add the cooked daal, ground mixture, potatoes and salt. Mix everything and cook for 2-3 min. Add coriander powder, mix well and cook for about 2min again.